Will the ECB Hike Interest Rates? Lately, it seems that euro zone debt problems made the prospect of a rate hike from the European Central Bank (ECB) is close to impossible. But there’s nothing like a bold statement from the ECB President himself to remind the markets that, at the end of the day, inflation pressures are still the heart and soul of monetary policy decisions. In an interview with Wall Street Journal, Trichet shifted the spotlight away from the ongoing debt drama to the rising price levels in the euro zone. The central bank head pointed out that euro zone inflation posted a surprise leap from 1.9% to 2.2%, outpacing its target inflation of 2.0%. On top of that, economic gurus predict that this figure would keep climbing until 2.5% in the next couple of months. He also mentioned that booming economies, such as Brazil and China, are boosting demand for commodities. And, as we all learned in Economics 101, higher demand for goods pushes their prices up. As long as these emerging economies keep growing, prices of commodities could keep rising and contributing to inflation all over the globe. After treading in negative territory for the majority of 2009, inflation has constantly improved, rising consistently month after month. 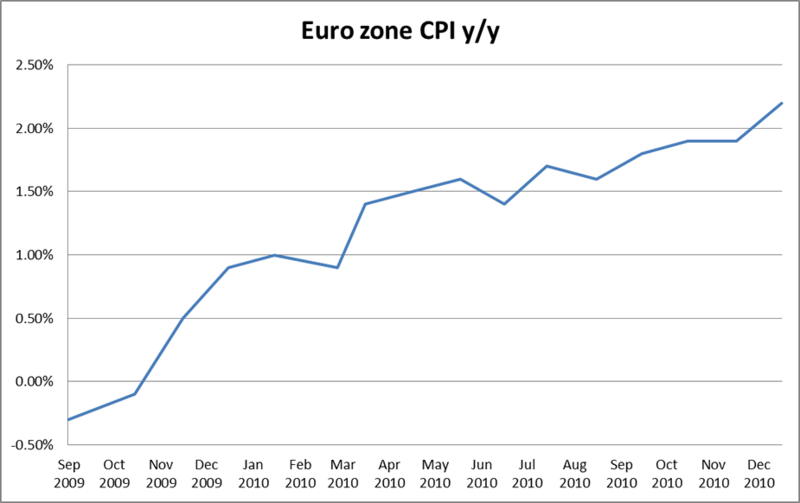 By December 2010 inflation has surged to 2.2%, which is above the European Central Bank’s 2.0% inflation rate mandate. The inflation rate is predicted to rise to 2.5% by March by end of the quarter. Traders say the trend is your friend, but I don’t think that applies to the ECB! If inflation continues to rise, then the ECB will have no choice but to consider hiking rates. Recall that higher borrowing rates are usually used by the central banks to control fast economic growth and inflation. But with Greece and Ireland already up to their necks in debts and Portugal and Spain sitting on hot water over their troubled balance sheets, an interest rate hike is the last thing the euro zone needs! So how will the ECB balance hot inflation numbers and struggling economic growth? Trichet suggests that managing inflation expectations a good step. For one, if consumers think that prices will rise for the next few years, then they are likely to ask for higher wages. Given the possible effects of an interest rate hike on the euro zone, I would not be surprised if markets send the euro pairs all over the charts on speculation of a rate hike. After all, while some traders might cheer at the possibility of higher cash rates, others might get jumpy on its effects on the region’s troubled economies.